It always amazes me when the first plants bloom in January. Despite the cold, wet and windy weather delicate looking blooms appear without fail each year. 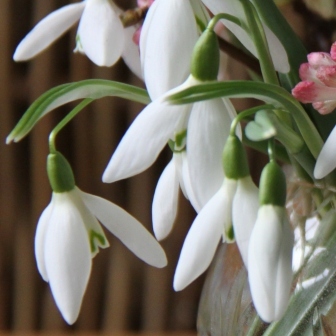 The first Snowdrops are flowering now and in my garden one tough shrub has been flowering all winter. This hardy Viburnum is a strong growing upright woody shrub. I have two of these beautiful shrubs. One was nibbled by cattle so I swiftly moved it out of their reach into the Spring Border across the path from the other unchewed one. It soon caught up. This shrub is upright and open so you can see through it and there’s no need to position it at the back of a border. Occasionally I cut a few stems for the house… they last a long time indoors but they are a bit stinky. Outside the scent is lovely but inside I find it too overpowering really. 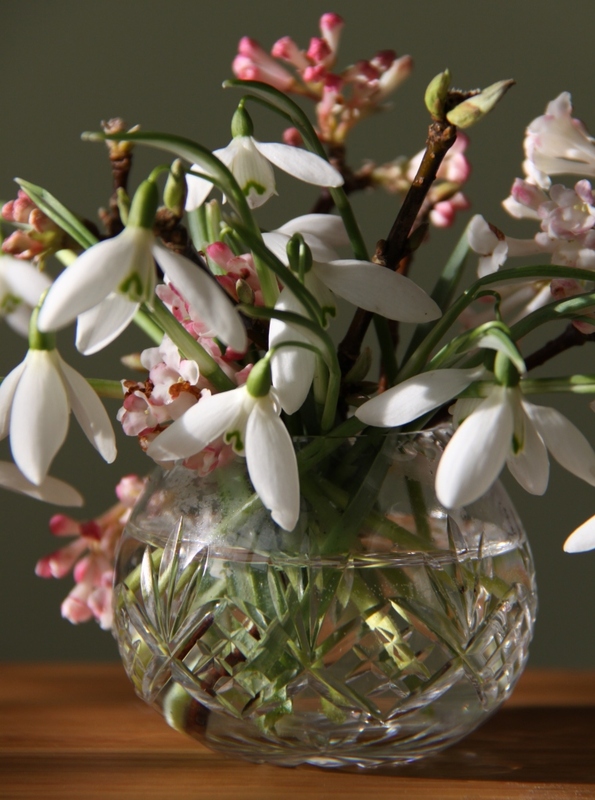 They look beautiful with snowdrops. Other winter flowering woodland plants work well with this shrub. Underplant it with early flowering bulbs such as Galanthus nivalis, Snowdrops, Crocus or Helleborus niger, the Christmas Rose. What a beautiful arrangement! And a lovely blog – I’m glad to have found you.